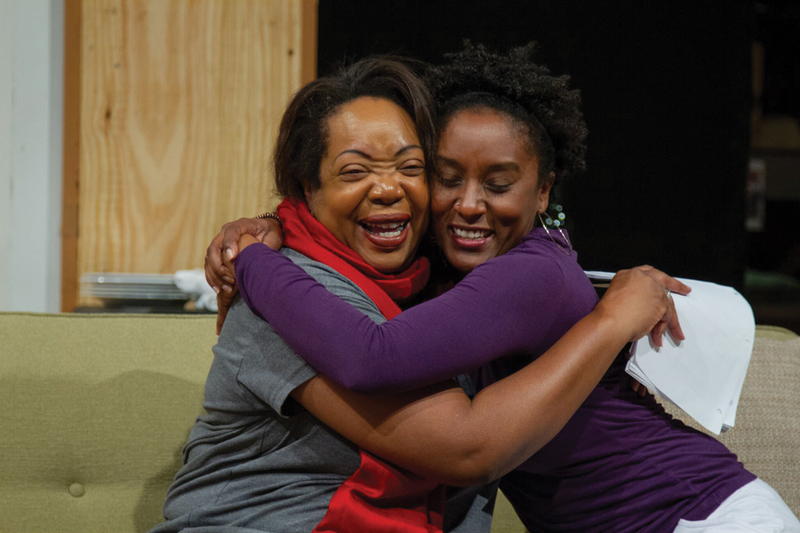 Two actors embrace while rehearsing for “Familiar.” The show, written by actor/playwright Danai Gurira, focuses on a family of Zimbabwean-Americans living in Minnesota. When Celeste M. Cooper was in college, she was often the only person of color in her acting classes. Cooper said she would often step into roles typically played by white actors, or roles that didn’t specify a race. Cooper is getting a different experience in her current role. As a cast member of Steppenwolf Theatre’s production of “Familiar,” Cooper gets to tell a story about the black experience with a majority-black cast, a job she finds both invigorating and incredibly personal. “Familiar” is a play written by actor/playwright Danai Gurira, famous for her roles in “Black Panther” and “The Walking Dead.” The show premiered at the Yale Repertory Theatre in 2015, and had an Off-Broadway run at Playwrights Horizons the next year. Steppenwolf’s production is directed by Danya Taymor and opens in previews Thursday. The story focuses on a family of Zimbabwean-Americans who lead a comfortable, Americanized life in Minnesota. When the parents of the household disapprove of the eldest daughter’s decision to hold a traditional Zimbabwean wedding with her white finacé, the resulting friction brings to light old secrets and lingering family resentments. Cooper plays Nyasha, the younger sister of the bride-to-be, Tendi. School of Communication Prof. Marcus Doshi serves as the lighting designer for “Familiar,” the eighth show he has worked on at Steppenwolf. Doshi said Taymor asked him to join the “Familiar” team after previously collaborating on other Steppenwolf shows. Doshi said he connects with the show because of its exploration of family dynamics. The play, he said, follows multiple conflicts between various members of the family, from the mother’s tense relationship with her sisters to the divide that forms between the older and younger generations, all of them rendered very authentically. Doshi also said the show explores the experience of being an immigrant in America. As the child of an immigrant, this was something Doshi said he related to. Cedric Young, who portrays Donald, the father of the family, said the show tackles a lot of material he has also had personal experience with, such as family issues and loss of a child. He said in spite of the sometimes-challenging material, he finds the cast and director have made the entire process a satisfying experience. Young said he thinks the show is important because its message of trying to understand others resonates in today’s divided time. Young hopes the audience is able to come out of the play appreciating the need for empathy.